This articles deals with some of the new features in Hibernate 4, the most popular Java object/relational mapping framework today. Among the novelties brought by versions 4.0, 4.1 and 4.2 the current CR (Candidate Release). Hibernate is the object/relational mapping framework best known and used for the Java platform today. It was also one of the pioneers of this kind of persistence solution and was used as a basis for the definition of the Java Persistence API 2.0 standard, given its popularity. In his many years of existence, the project grew and launched several subprojects such as Hibernate Shards (for persistence in distributed databases), Hibernate Search (bringing more advanced features of textual research to the database), Hibernate Validator (implementation reference JSR 303 - Bean Validation), Hibernate OGM (for NoSQL solutions), among others. We will discuss the core framework, which at the time of creation of the subprojects was called Hibernate Core, but is now known as Hibernate ORM. We will use all these names (Hibernate, Hibernate Core and Hibernate ORM) to refer to the same framework. In December 2011, JBoss (the company that coordinates the development of the framework) has released version 4.0 of Hibernate ORM, registering a jump from the previous version, 3.6.9. In February 2012 there was a smaller breakthrough with the release of version 4.1. In late January, was published Candidate Release (CR) of the 4.2 version of the framework core. While many users eager for new features were already using Hibernate 4.x for months, probably the most conservative clung to some family version 3.x until the new versions were more stable. Use of the JDK 1.6 and JDBC 4 as the basis for development. In this paper, we present examples using some of the features listed above. We begin, however, with download instructions and "installation" of the framework. Hibernate ORM can be obtained on the official site framework (see Links), in the Downloads section. It is distributed in two ways: packets containing binary distribution, and document sources or by means of a repository Maven artifacts. The Maven is a software project management tool that allows a developer to indicate the dependencies of a project (for example, Hibernate framework) and trust the tool to obtain the required JAR files, including any transitive dependency, repositories on the Internet. Lib/optional: this folder contains JARs for the optional framework features such as use of the pool C3P0 connections or ehcache cache instead of the solutions used by default if no specific configuration is made (these settings are outside the scope of this article) . The most practical solution, however, is to use a dependency management tool, such as that offered by Maven. The following are the instructions for creating a project managed by Maven and inclusion of Hibernate 4 as dependency. To follow these instructions, you must have installed the Eclipse IDE and the plug-in m2e - Maven Integration for Eclipse. The first can be obtained free of charge on its website while the latter can be installed within Eclipse itself, opening the Help > Install New Software menu, selecting the repository and filtering packages available for m2e. Once installed the m2e and restarted Eclipse, create a new project Maven Project type. During the wizard for creating this project, select the option Create a simple project and at the last screen of the wizard, complete project information as shown in Figure 1. Figure 1. 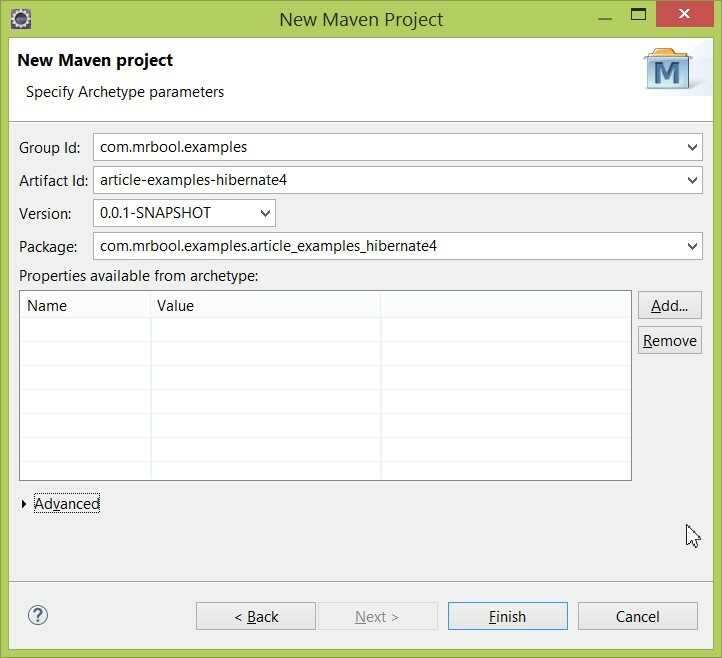 Information for creating a project Maven-based in Eclipse. Return to the Eclipse preferences, section Maven > User Settings and click in the Update Settings button. Listing 1. Maven configuration to use the artifacts repository of JBoss. With the configured repository, open the pom.xml file of the project previously established for the specific Eclipse editor (provided by the plug-in m2e). Go to the Dependencies tab (located on the bottom of the editor) and, in the Dependencies column (left), click the Add button. In the dialog box that opens, there is a search field above the Search Results field. 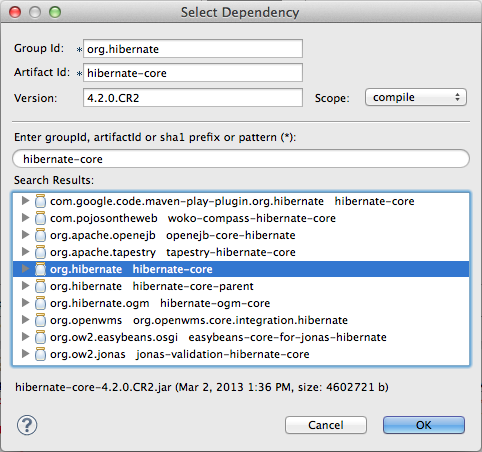 Look for hibernate-core and select the artifact that is in org.hibernate group, as shown in Figure 2. Note that the value of the version attribute may vary depending on the final version of the framework at the time you are following these instructions. You can also specify a different version of the framework to use, if desired (ex . : 4.1.10.Final). If the item org.hibernate hibernate-core shown in Figure 2 is expanded, will be presented all framework versions available in the repository and you can choose the one you want. Figure 2. Adding Hibernate as dependence on the project using Maven in Eclipse. and com.fasterxml / classmate / 0.5.4 (tools that Hibernate requires to perform code introspection activities). Note that the latter is added to the POM as bundle type and you need to change it to jar type by clicking the Properties button. After these additions, the source code of the pom.xml file (available in the latest editor tab) should be similar to Listing 2. Listing 2. Newly created project Maven configuration, including Hibernate, H2, and Jandex Classmate as dependencies. After saving the file, Eclipse will, behind the scenes, retrieve all the JAR files needed to use Hibernate in this project. In the Package Explorer view, under the project created, you can see the Maven Dependencies item, containing all the JARs being added to the project classpath. At this point, your project is ready to use Hibernate. If you are not using Maven, check out the Links list the sites where you can download the H2 database and Jandex Classmate and tools. This simple system has only a persistent class called Contact, whose source code is shown in Listing 3. Listing 3. Source code of the Contact class, single persistent entity in the illustrative example. As can be seen, the mapping of the Contact class to the relational world is done through annotations, using the annotations defined in javax.persistence package, part of the Java API. The class is defined as a persistent entity using theEntity annotation. @Id and @GeneratedValue identify the attribute of this class to serve as a primary key in the database table, setting automatic generation of values for this column. String attributes are not recorded, but the default is every attribute be persisted unless otherwise stated. Finally, @Temporal(TemporalType.TIMESTAMP) specifies that from the lastUpdateDate attribute should be stored both date and time. To use this class with Hibernate, you just need to create the hibernate.cfg.xml file with the general configuration of the framework (connection, cache, dialect, etc.) and instantiate a session factory from it. Listing 4 shows an example configuration file that could be used to implement the example. However, as will be seen later in the article, to illustrate the new features of Hibernate 4 programmatic configuration is used. Listing 4. Example of general configuration of Hibernate, hibernate.cfg.xml file. The commands listed above, that manipulate instances of the Contact class, and the user interface are implemented in com.mrbool.agenda.domain.Contact class. This and other classes are part of the sample application and some of its parts will be displayed throughout the article. It is not necessary, however, to show them here in full. Hibernate was already a well extensible framework. For example, new databases dialects can be created and used, how Hibernate accesses the attributes of the objects can be changed to a custom shape, interceptors can be run at various points of the persistent cycle, etc. Now in version 4, in the spirit of the OSGi platform, Hibernate is even more extensible, declaring various types of framework functionality as services, with a well defined interface and therefore likely to be replaced by customized versions, developed by its users. The implementation framework that had every feature is still offered, of course, as the default implementation of the service in question. Developers who require a specialized behavior towards any of the Hibernate services no longer have to change the source code of the framework, simply create a new implementation of the service in question and plug it to the record. New services can also be created since they extend the org.hibernate.service.Service interface. The implementation of a service can declare dependence on the interface of another service through the annotation @org.hibernate.service.spi.InjectService and have it injected automatically by the framework. Another option is to locate the service required directly on record that, in turn, can be injected if the service that implements the interface org.hibernate.service.spi.ServiceRegistryAwareService. Through the service entry, overwrite or extend the framework was easier. The task, however, is not easy and requires advanced knowledge of operating an ORM framework, requiring in very specific cases (by the framework definition, the most common cases have been designed and developed). The change, however, affect 'common' users of the framework in a common task: the creation of the session factory. Like any Hibernate user already knows, to perform persistence operations using the framework you need to open a session of use (class org.hibernate.Session), consisting of an object that abstracts the connection and communication with the database via JDBC. For instances of this class, you must create a (usually single) session factory (org.hibernate.SessionFactory class). By the Hibernate 3, the code to create a session factory from the hibernate.cfg.xml configuration file (such as the one shown in Listing 4) was like the code shown in Listing 5. Starting with version 4, is possible to get the session factory associating it with a central registry framework, as shown in Listing 6. Listing 5. Former way to obtain the Hibernate session factory. Listing 6. New ways of obtaining the session factory Hibernate. Listing 6 shows two ways of obtaining the session factory. The first is similar to the method used previously, based on a Configuration object. The difference is that it also created a record of services (ServiceRegistry) from a builder object (ServiceRegistryBuilder). The applySettings() method of the object constructor applies the same settings of the config object to the registry to be created. Finally, the session factory is created by passing the record as a parameter so that Hibernate can access the services through it. The second form does not use the Configuration class, setting the builder object registration services through a specific method: configure(). The registry service is just created and then passed as a parameter to create an instance of MetadataSources. After adding the persistent classes of that body (note: in the case of XML via mapping should be used addResource() instead of addAnnotatedClass()), it is used to build the meta-data that ultimately are in turn used to construct the session factory. Although more verbose, new ways to get the session factory using the central registry, allowing overwritten and extension of the framework. For this reason, the old form is marked as deprecated and must be removed in version 5.0 of the framework. All three ways to get the session factory assume that a hibernate.cfg.xml configuration file is in the root of the classpath (there are ways to specify your location, otherwise). However, the sample application does not use this configuration file. This paper has presented some of the new features of version 4 of the Hibernate framework (some of which are present since version 4.0, other added in increments 4.1 or 4.2): the new central registry services (and how it affects the creation of sessions factory) the use of multi-tenant database and the definition of persistent identifiers natural classes. Such features were addressed by example that revolved around a simple application for managing contacts called Calendar. As the Hibernate evolves within the 4.x series news analyzed become more robust and reliable, ready to be adopted by real systems development projects to be implemented and made available to its users. Some obstacles, however, still present: the setting to use multi-tenant database is still quite complex and changes in the API cause confusion with respect to configuration files (exceptions were launched for the file format in some cases). It is expected, however, that the continued development of this open source framework to resolve the outstanding problems and that he keep as mapping solution object / relational most popular for the Java platform.